Defending the downtrodden is one of the defining principles of the Jedi and those who would follow in their footsteps. However, the Protector makes this their sole duty. 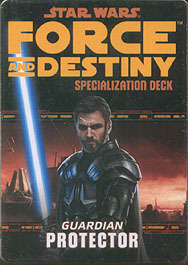 This deck requires the Force and Destiny Core Rulebook and includes cards for all 20 talents available in the Protector specialization.